KIEV, Ukraine -- Ukraine supports an initiative by Kazakhstan, current chairman of the Organization for Security and Cooperation in Europe (OSCE), to convene an OSCE summit, and is ready to actively participate in the discussion of a new treaty on European security, President Viktor Yanukovych said on Wednesday. "We support Kazakhstan's idea to convene a summit of the Organization for Security and Cooperation in Europe, and we're ready to work on the summit's agenda. We are ready to actively participate in the discussion of Kazakhstan's initiative on a new treaty over European security," he said at a meeting with Kanat Saudabayev, the foreign minister of Kazakhstan and Chairman-in-Office for the OSCE. Yanukovych stressed the importance of reflecting in the new treaty security guarantees for states that voluntarily give up their nuclear arsenals, as well as for states, such as Ukraine, that are not members of any military bloc. He said the OSCE is the "most suitable forum" for discussions on European security issues. 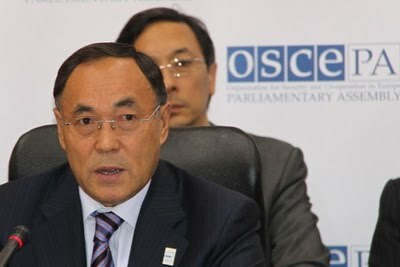 Saudabayev, in his turn, said that the OSCE and Kazakhstan attach great importance to developing relations with Ukraine. "We are willing to further strengthen cooperations with Ukraine in various fields," he added. Saudabayev arrived in Kiev on Tuesday for a two-day visit to Ukraine.